Mauri read about the concert on Facebook, and since we didn’t have a rehearsal tonight we were free to go to Newberg Christian Church and check it out. We were glad to add two to the other 38 people in attendance. We might have joined a little bit in the embarrassment of the small turnout even though we were ourselves visitors. But the guest musicians, gospel quartet The King’s Heralds, gave us their all. After singing a couple of rousing warm-up songs, they introduced each other. Something was made of the bass singer (far right) being at one time from Dundee, Oregon, and when he talked about recognizing someone in the audience he pointed back to us and said he thought he recognized Mauri Macy. Turns out he remembers making a recording with his dad in our living room thirty years ago — when he was 14! I have to say it again, just to make myself believe it. He remembers making a recording with his dad in our living room thirty years ago — when he was 14! Of course Mauri looks pretty much the same as he did thirty years ago, so the bass singer, whose name is Jeff Pearles, at least had that advantage. Gotcha wishing you had come, don’t I? Here’s a 49-second taste of what you missed. 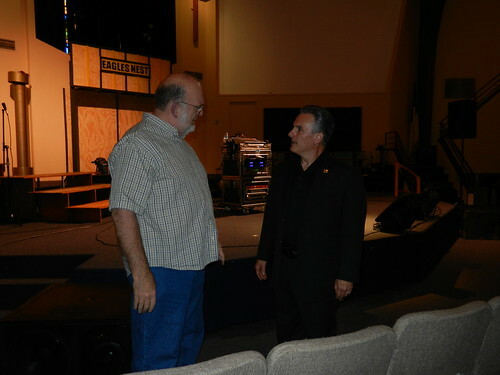 Of course after the concert Mauri wanted to talk to Jeff, whose incredible memory astonished us again as he recalled a song Mauri and Margaret-Rose recorded titled “And Sarah Laughed.” He was particularly drawn to the vocal laughter as the song ended. I mentioned, didn’t I, that this was thirty (3-0) years ago? Update: I learned since posting that google sent me to the King’s Herald’s old website. Here’s a current tour schedule. This entry was posted in in the neighborhood, nostalgia, old friends. Bookmark the permalink. Sherry–Do they have a more current schedule than is on the website you linked to? My dad would love to go hear them if they’re in his area, but the schedule on their website ends in 2008. Newberg sometimes lacks a bit on publicity. Community band attendance at NHS etc. Sorry we didn’t know. 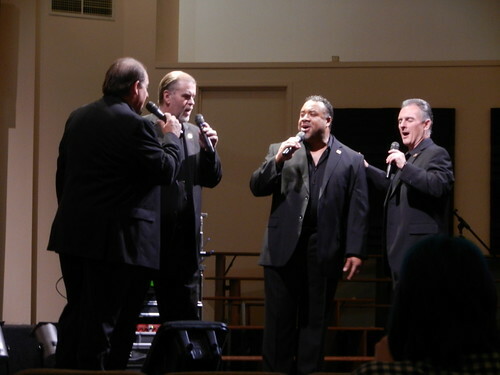 Gospel quartets are “big” in Yuma…packed out.